Burger King published a full page advertisement in USA Today announcing the introduction of a new item to their menu: a "Left-Handed Whopper" specially designed for the 32 million left-handed Americans. 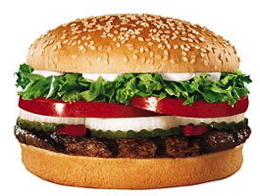 According to the advertisement, the new whopper included the same ingredients as the original Whopper (lettuce, tomato, hamburger patty, etc.). However, the left-handed whopper had "all condiments rotated 180 degrees, thereby redistributing the weight of the sandwich so that the bulk of the condiments will skew to the left, thereby reducing the amount of lettuce and other toppings from spilling out the right side of the burger." Jim Watkins, senior vice president for marketing at Burger King, was quoted as saying that the new sandwich was the "ultimate 'HAVE IT YOUR WAY' for our left-handed customers." 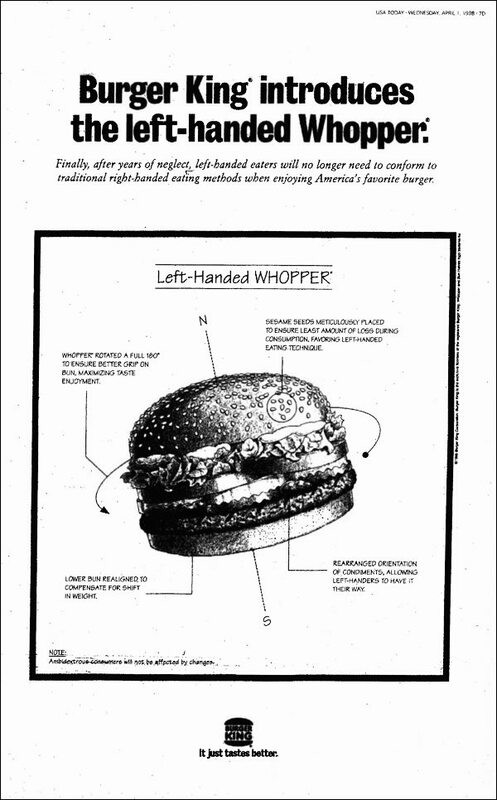 The advertisement then noted that the left-handed Whopper would initially only be available in the United States, but that the company was "considering plans to roll it out to other countries with large left-handed populations." The following day Burger King issued a follow-up release revealing that although the Left-Handed Whopper was a hoax, thousands of customers had gone into restaurants to request the new sandwich. Simultaneously, according to the press release, "many others requested their own 'right handed' version." I could have saved them a lot of money! The Left-Handed Whopper is a great joke too. Reminds me of the Ren Faire I used to go to in Mass, there was a store that sold (every year) Right handed mugs and Left handed mugs, right-handed on the right side of the store and left-handed on the left. Until I actually stopped and looked at the things (to see that it was simply which way the cup handle was pointed) I totally thought that was a cute idea. derek wrote "im lovin it", possibly without realizing that it's the current slogan of BK's biggest competitor, McD's. Now *that's* funny! What I find funniest is that of everything I'm reading on this site, this is the one (so far) that I think I remember seeing. I believe I was sitting in an airport, killing time reading the paper, and thinking to myself, "What in the world kind of nonsense is this," not realizing it was 1 April. The left handed burgers taste better too! I really have to ask if anyone who fell for that was asking themselves "does it really matter?" Round, square, triangle, whatever... Perhaps it only applied to asymetrical burgers. This was run in Kenya a number of years ago, was really funny especially with pictures at the front page of the paper. Well Jennifer, I hate to be the one to inform you of this, but there actually are such things as right-handed and left handed mugs, and pens. Things righties don't notice, but be being a left I do end up noticing, most of the time it is simply do to if you can recieve all the perks of the product by using your left hand, things such as images drawn on the inside side of the mug that you cann't see when drinking with your left hand, or words written on pens which are upside down to left-handed writers, and drink holders on the wrong side. Ohh yes it is a true bias, but I do also find this left-handed burger idea brilliant. But it doesn't matter, because it takes two hands to handle a whopper! I guess no one remembers that slogan. LMAO I remember my dad actually telling me about this back when I was a little kid. Proud to be a lefty! Only in America. Are they putting stupidity genes in the food over there or something?!? You are right Jacob, only in America. BTW, do you know where I can get a spaghetti tree? Hehe! I'm left handed and I would be very confused with a left handed whopper. I'm 10 so I would be very curious and confused. LOL! Great joke Buger King!